Hi everyone! This weekend (June 23-25) we (Luke and Gary) participated in Jamchester 2017 – the second annual incarnation of the UK’s largest professional game jam. With the help of composer / sound designer Richard Evans, over the 40 hours of the jam we created a mindbending local multiplayer game called SYNCHROCIDE. Two players control two characters each, on the same controller. Each player’s future character must catch the other’s past character to win. And we’re proud to announce that SYNCHROCIDE won the “Best Company Team” award! Without further ado, here’s some gameplay! The game is fully playable and can be downloaded from its Devpost page, and you can check out the other 43 fantastic entries on the Jamchester Devpost page. The theme of the jam was “Shape the Future”. There were loads of awesome interpretations of this theme, ranging from time travel to recreating historical events. Our take was a cyberpunk vision of parallel realities colliding. In this scenario, your past and future selves have appeared in the same time, along with your counterparts from the parallel dimension. Unless one side is eliminated, time and space will collapse. To win, you must commit SYNCHROCIDE – killing your parallel opposite. Early on we had the idea to make a local multiplayer game where players share the same controller, and wanted to see how players would respond to not only sharing a controller, but having to multitask. Each player has to simultaneously attack and defend, as well as manage resources (the sprint stamina of their “past” character, which must be refilled by holding a bumper and wiggling the stick), while also holding down the trigger at all times as a “dead man switch” to prevent them ripping the controller away from the other player. All in all – it’s a lot to deal with! The result is surprisingly tactical. We quickly found people using a wide variety of strategies (once they’d got their head around controlling two characters at once!) and it’s given us a lot of ideas on how we might expand the concept. We were fortunate enough to work with Richard Evans on composition and sound. Richard’s speciality is dynamic and interactive music, so even though time is precious in a game jam, we were all keen to make a cool music and sound system for the game. This worked out fantastically! I worked closely with Richard the whole time to design and implement the system, and his composition fit the theme perfectly. We devised a system with multiple layers of music which would fade in and out, and layer on top of one another, according to various in-game variables. For example, when both “future” characters were near each other, an aggressive beat fades in, while if a “future” is about to catch a “past” two separate layers – drums and then screeching strings – are added to the mix. With these and other variables being totally independent, the music shifts constantly to reflect the situation and really is more than the sum of its parts. Thanks to his efforts, Richard got a well-deserved special mention when the Audio award was announced. Once the three of us decided upon the core mechanics, Gary began working on the art style. We realised early on that, due to how players had to hold the controller together at 45 degrees each, the game needed to be isometric to feel right. There were a variety of different inspirations for the art of SYNCHROCIDE and it took us some time to develop a visual style we were happy with. 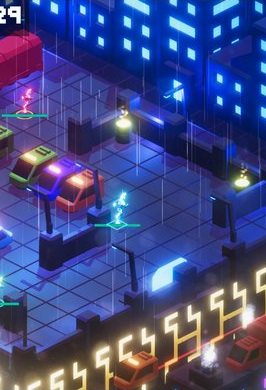 We started by looking at existing isometric games such as Tokyo 42 and Monument Valley. Both have a beautiful art direction and instantly started to influence the visuals of our game. Complimenting this was a phenomenal retro cyberpunk project by Sinclair Strange that’s really stuck in our minds over the past few weeks. Gary created a flat, colourful, appealing yet dark look that harks back to classic cyberpunk art while looking fresh and exciting. With a little time to spare, he even managed to put hovercars occasionally going past the scene, adding a feeling of life to the cityscape. It’s not all roses. Ultimately we realised that the idea of having both players use the same controller held the game back a bit, limiting the complexity that players could deal with and artificially raising the learning curve. While it was fun seeing people play with the system, we’ll probably make a version 2 which allows two separate controllers. That said, without the shared controller concept, we probably wouldn’t have settled on the core multitasking mechanic that makes SYNCHROCIDE such a thrilling, challenging and competitive local multiplayer game. Overall, we’re really proud of SYNCHROCIDE. The level of polish we’ve managed to give the game in those 40 hours has frankly astounded us. Our past game jam experience has been a key factor in this; we work smoothly, quickly and decisively, with fewer mistakes and more time polishing the final product. As well as producing something awesome, it’s always nice to take a (really stressful and sleepless) break from regular game dev and focus on something new. Jamchester in particular is a fantastic event like this, with a perfect mix of competition and collaboration. The quality bar is incredibly high, pushing jamming to its limits, but with so many experienced and professional teams, everyone’s more than happy to help each other out. And on that note, peace out.